Cashew came to India with the Portuguese and is a native of Brazil. It is the third largest consumed tree nut in the world. The Indian soil favoured this nut so well that India has been cultivating cashew nuts as a popular native crop, making this country the second largest cashew producers in the World. Therefore, listing those dealing in Indian cashew nuts among the leading cashew nuts exporters and suppliers. The tropical climatic conditions have helped in cultivating cashew nuts along the eastern and western coastal stretch of India. As a matter of fact, over 60 percent of the cashews consumed globally are processed in India. 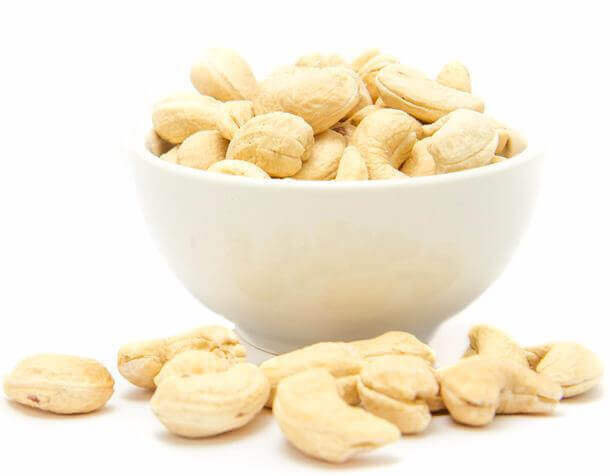 Shimla Hills is one of the prominent Indian cashew nuts manufacturers of processed cashews from India. Being a trusted bulk cashew nuts exporter, we export quality cashew nuts from India. We maintain the quality of cashews by following food safety norms and stringent checks. Depending upon the customer specifications, we can offer cashew nuts in different weight requirements. What goes into cashew processing? It takes about 20-21 days and many labour intensive stages for cashew nuts to reach the delicious edible state. Once harvested, the nuts are collected and amply dried in the sun. They are then steamed and shelled using cutting machines to extract kernels. The kernels are passed through Borma dryers to remove minutest levels of moisture. Before the kernels are sent for peeling, the husk is removed from the dried kernels – this step defines the quality of cashew. The sorting of kernel takes place according to AFI (American Food Industry) standards into various kernel counts, sizes and grades. After this the kernels are sent for inspection once before passing through metal detectors and finally packed into cartons. Shimla Hills is one of the reliable cashew nuts exporters and suppliers and the first choice of many countries of the world. The major international buyers of Indian cashew nuts include countries like Japan, UAE, Canada, Saudi Arabia, Singapore and Israel.